The EJ Basler Company is pumped to host 100 Leyden High School students for this year’s Manufacturing Day on Friday, October 2, 2015. The students will be coming from East Leyden High School’s machine shop class. This is the fourth year in a row that we have been able to facilitate this event and every year the participates grow. Last year’s event resulted in three new interns that came to work with us this past summer. It is a core belief here at E. J. Basler, that the future of manufacturing lies in today’s youth. Can’t wait to #rockmfgday this year! 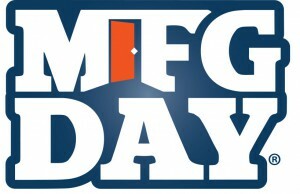 Here is some information about Manufacturing day from www.mfgday.com. An annual event during which North American manufacturers open their doors to showcase the potential of modern manufacturing and foster interest in manufacturing careers. Always officially celebrated on the first Friday in October, Manufacturing Day can be celebrated any day of the year when a manufacturer organizes an event to share what they do with their community. Each year the official calendar of events includes events that happen in nearly every month of the year. Manufacturing Day events occur at manufacturing facilities and educational institutions across North America. Events in can be found on the Manufacturing Day website’s “Find an Event” page: www.mfgday.com/events. This events list is updated daily and can be searched by country, state/province, and city.